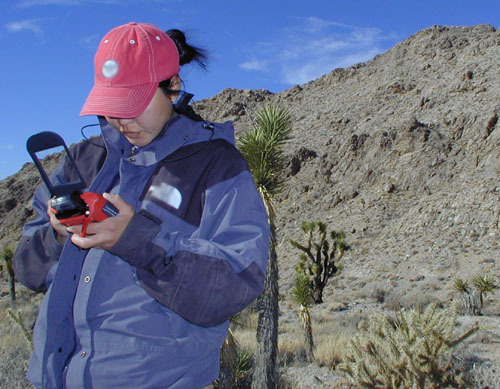 MIT student working with GPS and GeoPocket. The GPS can encourage students to depend on the device for position information rather than matching the topography to the map. Provenance: Image courtesy of CSG, MIT. Geodesy involves the measurement and monitoring of the size and shape of the Earth, including its gravitational field, in a three-dimensional, time varying space. 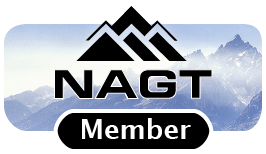 It includes topics such as global positioning system (GPS), airborne or terrestrial lidar (TLS), gravity, Earth's mass distribution, plate motion, sea level, soil moisture, snow fall, vegetation change, subsidence, isostasy, fault strain, glacial movement, volcanic deformation, landslides, and more. Technological advances in geodesy are advancing the way we make measurements and observations, leading to a better understanding of Earth processes. Integrating geodesy into the undergraduate curriculum aids students' understanding of the process of science, including how measurements are made, and can teach valuable skills in using cutting-edge instrumentation, tools, and data-sets. Learn more about setting effective course goals in the Course Design Tutorial. You can also explore course goals from others' courses using the syllabi available in the course collection. The resource collections below are organized to provide a rich set of materials to draw from in constructing the specific set of learning experiences you want for your students. You may also want to explore specific pedagogies to incorporate into your classroom such as teaching with data or teaching with Google Earth. Learn more about teaching methods from the On the Cutting Edge teaching methods module. Course descriptions contributed by faculty for courses involving geodesy, including course syllabi and goals. Teaching activities involving geodesy, contributed by faculty members. Visualizations including animations, images, diagrams, and short movies. Additional resources, including websites, visualizations, and papers related to geodesy. 2010 Teaching Geodesy in the 21st Century workshop - A follow-on to the 2007 On the Cutting Edge Geophysics workshop, this workshop, sponsored by UNAVCO, focused on applications of geodesy to different subdisciplines of Earth science. 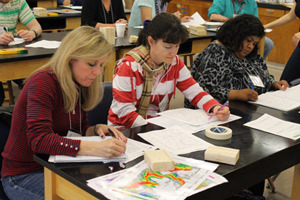 During the workshop, participants worked together to develop interactive, engaging learning material for students, and helped identify aspects of geodesy to be included in introductory college level geology education. (learn more about the follow-on workshop series from On the Cutting Edge). Contribute Materials: We encourage faculty to contribute course descriptions, teaching activities, visualizations, and references to continue to build our collections. 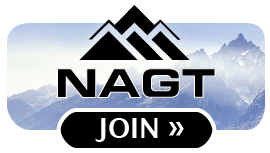 Join the email list of faculty who teach geodesy or read the archives of email list discussions. These pages have been developed in conjunction with UNAVCO with funding provided by a grant from the National Science Foundation - Division of Undergraduate Education. Image courtesy of CSG, MIT.